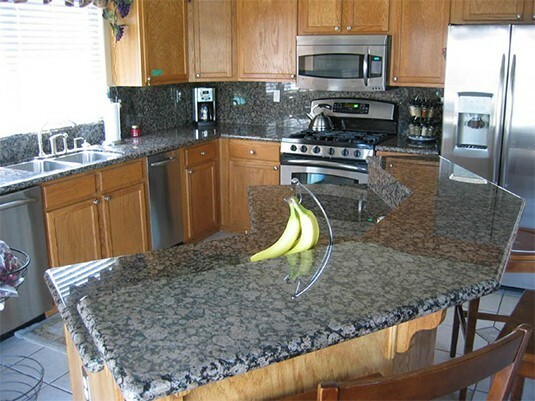 As we have previously mentioned, granite worktops are our specialty. We are experts in granite worktop manufacture and installation and you will probably not find a better offer than ours on the market. Why granite is the best material for kitchen worktops? But why should you choose granite worktop over a cheaper kitchen counter made of artificial materials? It is pretty simple – treat the granite worktop as an investment! Imagine a scenario, where you have to renovate your kitchen every couple of years due to the natural damage done by cutting, spilling, heating and other actions normally performed in the kitchen. And now imagine a counter that will resist all those factors with ease, with only a small amount of work and regular, once-a-year maintenance. Now – renovating a kitchen regularly will cost you much more than a design centered around granite worktop which will last literally decades without the need to replace it. What is even more interesting is the fact that granite, as a natural material, can be found in a huge variety of colours and patterns, and this in turn means that no matter what overall interior design you choose for your kitchen, you will surely find a type of granite which will match your house décor. Furthermore, you can be sure your kitchen worktop made of granite will be completely unique, as granite is a natural stone that never appears the same, just as a snowflake! Check the types of granite we have in our offer to see from how many variations you can choose from to get a kitchen worktop you dream of. If you are interested in our offer, simply contact us. If you are from one of London’s borroughs you’re in luck, as we are situated nearby and we are able to deliver an express service to many neighboring locations, such as Hounslow, Slough, Richmond, Wandsworth, Windsor, Westminster, Kensington, Chelsea and other London areas.